Just have time for a quick update. 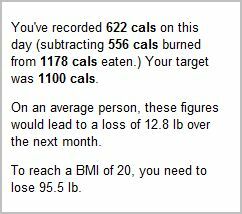 Today was better than yesterday – not quite so many calories. Although I STILL have the munchies. They’re incurable! I wish they would go away!!! Also, I worked out for an hour, wish was good. However, I felt like I just couldn’t really get into it as much as I wanted to. My heart rate stayed fairly low. Tomorrow’s workout should be better because I’m going to a step class. Hard to slack off there. Good news: I started the day with 55 minutes of fairly intense cardio on the elliptical. Bad news, I had the munchies all day long, which is very similar to the bad case of munchies I had last Tuesday. I don’t know what it is about Tuesdays. This time, however, unlike last Tuesday, I gave in to the munchies a bit too much. There were delicious, soft, chewy, oatmeal cookies. Had a couple of those. A few chips, a few crackers. It all adds up so fast. I really, really need to get this nibbling here and there under control! I didn’t track calories for today because I really have no idea, but I would guesstimate around 2500. With my 600 burned through exercise, probably came out about even. I really wanted some huge calorie deficits this week, because I know that won’t be possible this weekend, but tomorrow is a new day and I’ll do the best I can then. I will try not to carry around the weight of today’s mistake and start with a fresh slate. Gotta love my original title! There’s not too much to report today. No workout 😦 Haven’t gotten my thank you notes for gifts at my wedding nearly two months ago, so I wanted to get that done. Unfortunately, that didn’t happen either! Also, I must confess I had a little run-in with cookies today. Ooops! The ridiculous all-or-nothing mentality is getting in my way again. I think, “Well, I know I will be traveling this weekend, so I’ll have no change to exercise and I won’t be in direct control of my food options, so I may as well go ahead and eat a cookie.” How ridiculous is that? When, I put in writing, it’s sounds utterly and completely ludicrous, but at the time, in my head, with a cookie in front of me, it makes some strange sense. Well, Mr. All-or-Nothing, you may have one this little battle but YOU ARE NOT going to win the war!!! Take that! That, said, I will be traveling, so I won’t be posting again until Sunday. And my goal for the weekend is not to let Mr. All-or-Nothing when any more battles. If I don’t want the food or need the food, then I WILL NOT eat just because I’m not able to perfectly on plan. I’m happy to report that I finally had a good eating and exercise day!! And when you have so much negative momentum going (as I most certainly didn’t after so long of barely even trying), it’s amazing that often all it takes is one good day that you just have to push through to get things going again. I need to take note and learn this lesson. 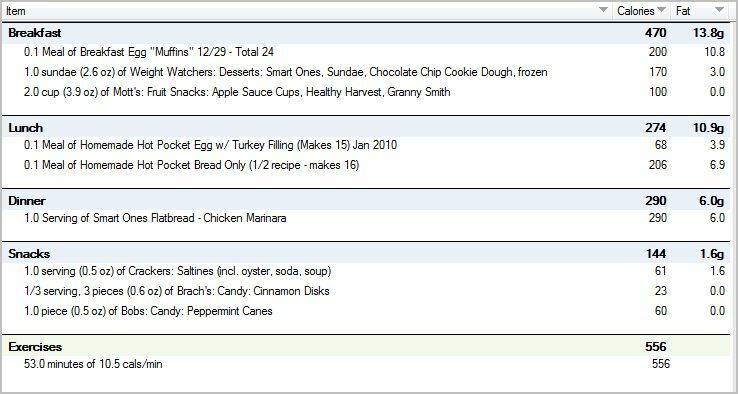 I will post the food journal below – close to 1200 calories – right on target! And I went to the Y today after work. I came home, threw on my workout clothes IMMEDIATELY (that step is key), threw a frozen dinner in the microwave (was super hungry since I actually didn’t snack at work), and was out the door. I got there around 5:30 and it wasn’t too crowded yet, even though it’s January. Crowd really starts picking up around 6-6:30. The snow and the cold didn’t kill me – I was only outside for a few seconds, and my car was still pretty warm since I hadn’t been home long. Worked out for 50 minutes on the elliptical. All that, and I was home by 6:45, got a shower, and I still have time to get a few things done! I really needed a day like this. After ending my last post on a negative note, I promised to share my much more positive plans for the future in the next post. Well, those plans include a 30 minutes daily on busy weekdays for blogging/reading other blogs. Well, I’ve spent about 20 minutes reading blogs, so I don’t have enough time left. But tomorrow I think I will definitely have some extra time for that.